The post Accelerating your IT Transformation with a Software Defined Data Center appeared first on InFocus Blog | Dell EMC Services. This is the third installment in a four-part series on the IT Transformation Storymap Hit the jump to read Part One and Part Two to begin the journey. In my last post in this series on the IT Transformation Storymap, I talked about how IT can transition from being a systems integrator to becoming a service broker. This post will focus on the Software Defined Data Center (SDDC) and the role it plays in accelerating IT Transformation. The hallmarks of IT Transformation, as depicted in the Storymap, are increased elasticity, lowered maintenance, greater efficiency, and more control. Many of these can be delivered directly by the Software Defined Data Center. 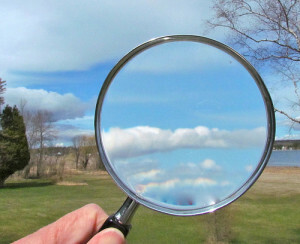 When think about it in terms of the hybrid cloud vision, the key to being able to run the workloads you need to run where it makes most business sense to do so is the ability to move those workloads between public, virtual private, and private clouds. This needs to be done in such a way that eliminates the need to worry about compatibility and performance across different cloud models. This is where the SDDC comes in. What the SDDC allows us to do is configure our infrastructure and operations in such a way that we can fully articulate what a workload is in terms of a profile for performance, availability, security, compliance, and other attributes. But more so, it allows us to be able to run that workload on any one of those cloud models so long as the specific service provider is able to meet the commitments defined in the attributes. So, in order to be able to realize that vision, we need to have an infrastructure that is capable of being defined by policy rather than by the manufacturers’ vision at the time of implementation. This is the basis of what vCloud suite and frameworks like ViPR deliver. You start with vanilla infrastructure that is configured and deployed by attributes defined by the software suite in order to meet the requirements of the applications. This is a wholly new approach to data center management. In the past, once a system was stood up in the data center, its configuration, by and large, was considered defined. The amount of RAM, CPUs, hard drive space, etc. deployed to it was often based on what was in the system when it was put into the rack. Now, we have the ability through virtualization and extended by software defined frameworks like vCloud, to configure the assets and security associated with the system in order to meet the requirements of a particular workload, blueprint, or pattern of compute. The SDDC allows us to create, according to policy, blueprints or patterns of compute that make up the basis for running workloads. The ultimate goal is to reduce the number of different patterns that we have to deploy across the data center. We want to reduce the amount of manual updates and configuration changes that need to take place. Instead, we want these things to be automated. The SDDC helps to reduce lock-in to a particular frame by configuring vanilla infrastructure to be dynamic, so that if tomorrow a particular workload needs more compute, memory, or storage, we can deliver that without having to interfere with the workload itself. This allows us to be very flexible in terms of the way we configure and reconfigure our infrastructure to meet the changing needs of our applications. As I’ve mentioned in previous posts, business agility is completely intertwined now with IT agility. In previous days, configuring infrastructure was a lock-in, which often meant that the IT organizations, and by extension, the business units they serve, were stuck with particular configurations or architectures because of the sunk capital associated with configuring them initially. 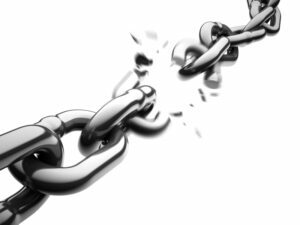 The SDDC breaks us free of some of those bonds. The post How Can IT Transition From a Systems Integrator to a Service Broker appeared first on InFocus Blog | Dell EMC Services. In my last blog, I set the stage for the IT Transformation Storymap and provided an overview of what it means when we talk about IT Transformation today. In this post, I will further discuss how IT must transition from being a systems integrator to being a service broker. Many IT organizations are faced with the challenge of remaining relevant to the business, because if they don’t the business will go ahead and find a new provider. This can lead to shadow IT and dissatisfied customers. IT becoming a service broker allows a business to get the services they need from the provider that it makes the best business sense to source from. For many of these services, the best provider will be their internal IT organization. For others, it might be providers from outside the firewall. IT not only needs to become a service provider, but it also needs to provide access to other providers utilizing the same processes, policies, and procedures regardless of where services are being sourced from. We now have the ability to deliver services in this fashion regardless of what infrastructure they’re being provided off of with enablers like vCloud and vCloud Enabled Service Providers. To combat shadow IT, sometimes IT needs to provide access to services that are being delivered from outside of the data center, simply because it makes business sense from a cost, functionality, or compliance perspective to do so. 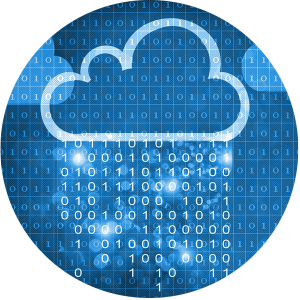 EMC has advanced cloud suitability platforms to provide an understanding of what applications can optimally run where and therefore boost operational efficiency. 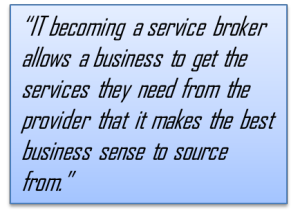 IT as a Service Broker is a more concrete concept than IT as a Service. That’s another reason why this is so important. The key is to understand what workloads can live where and which service providers the business should be granted access to. The concept is that you want to define the policies and blueprints before you go out and start matching those to service providers. In order to be able to do that, you need to first have a solid understanding of the applications and workloads you need to run in your environment. What this calls for is an application inventory, and an analysis of those workloads. That is the context you operate within from an IT perspective: what you build, who you partner with, and what you stop doing. You now have this concept of being able to provide access to multiple providers, utilizing the same policies and processes. You can also now take a look at, for each workload, what the business justification is for running them wherever. You’re also cutting down on shadow IT because, for example, if it makes sense to move something off to Amazon Web Services, you’re going to do that while still applying your own policies and processes. Everything from IT as a Service Broker comes through one portal. In order for this to be successful, you need to have that unified portal that is reflective of everything in the service catalog and a group of service providers who are capable of delivering according to your policies and processes. 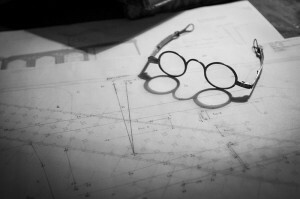 Through performing an analysis of your application portfolio, you will identify what blueprints need to be built. Once you have those blueprints and understand them, you can start lining them up against internal and external providers, and you’ll have an understanding of what capacity you need from those various providers. You’ll also understand if you have the ability to move workloads where they need to go. This then tells you what you need to build in terms of a software defined data center, which happens to be the topic of my next blog. To learn more about the services EMC offers to enable clients to become a broker of services to the business, click here. The post The IT Transformation Storymap appeared first on InFocus Blog | Dell EMC Services. When you think about IT Transformation, what’s the first thing that comes to your mind? Chances are, infrastructure was among one of your first thoughts. That makes sense, since infrastructure is a foundational component of any IT Transformation journey. 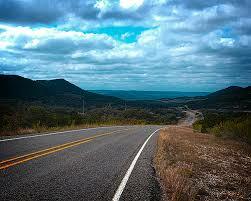 This journey, however, is about a whole lot more than just infrastructure. Recently, we developed an IT Transformation Storymap to graphically depict the many parts of IT Transformation. In this blog post, I will set the context for and provide a high-level overview of the storymap. In subsequent blog posts, I will go into specific sections of the image, and IT Transformation, in greater detail. There are really three transformations that take place as a part of IT Transformation depicted in our storymap. These transformations are happening across infrastructure, applications, and operations. Increasing revenue and lowering operational costs for the business while providing a multitude of services are the key goals for many IT organizations. This requires services that are both compelling and meaningful to the business, and to meet these goals they may be delivered from both internal and external providers. For many IT organizations, this is a dramatic change in the way IT is aligned. IT has historically acted as a Systems Integrator, a very labor-intensive approach with a lot of non-recurring engineering. This problem was first solved in the infrastructure realm, moving from non-recurring engineering to converged infrastructure solutions, now this concept must spread across all of IT. IT organizations need to be able to deliver an efficient, automated, and repeatable environment that is focused on the applications that are being built and delivered. IT should not focus on how to get the various components of the infrastructure to operate together. IT organizations need to get these new applications in the hands of the business as fast as possible to be able to be agile, realize new revenue streams, and help lower operational costs. This transformation is analogous to the way that automobile factories have evolved over the last century, hence the theme of our Storymap. Building a car has transitioned from requiring highly skilled technicians building their own tools and creating hand-made pieces painstakingly assembled into custom vehicles, to the new model of robotic integration on the manufacturing line. We are seeing a similar transformation within IT: instead of trying to integrate all the separate pieces and parts by hand to deliver many custom stacks dedicated to various applications, we are now standardizing on components that can be combined together to deliver many different services utilizing a small number of reference architectures. This factory analogy also extends to the “front office,” where previously a number of different teams worked separately. These teams perhaps optimized processes and collaboration within their own team, but rarely would this occur across teams. This area’s productivity was hindered by too many manual approvals, too many different tools that were all partially deployed, and disconnected processes that caused confusion and inefficiency. Needless to say, this caused operational costs to skyrocket. The new model of IT Transformation delegates a lot of the provisioning and management of the environment to the tools themselves which are now able to be fully deployed across the entire organization with low overhead, increasing transparency and control. These tools are governed by policy rather than manual interventions. The infrastructure is provisioning and managing itself according to blueprints that have been defined once and can be deployed by providers internal and external. We are now able to move from a manual process that required the heavy involvement of many different individuals to a highly automated and orchestrated set of processes that are executing and managing blueprints by policy. My next blog will dive deeper into how IT can transition from being a systems integrator to a service broker. The post IT Transformation Storymap appeared first on InFocus Blog | Dell EMC Services. There are three essential components that take place as part of IT Transformation: infrastructure, applications, and operations. View the storymap below and the many parts of IT Transformation, depicted closely to how automobile factories have evolved over the last century. And be sure to click on any of the icons to the right to learn how you can get the most from your applications and cloud cost-savings. For a deeper dive, read the related 3-part IT Transformation Storymap blog series. The post Getting Started with IT Transformation: A Proven & Practical Approach appeared first on InFocus Blog | Dell EMC Services. The post Federation Enterprise Hybrid Cloud: Even More Brokering, Automation, and Business Value appeared first on InFocus Blog | Dell EMC Services. I’ve spent the better part of the last two years working with our Solutions team on bringing our Federation Enterprise Hybrid Cloud solution to market with a suite of comprehensive services. One of the key attributes of the design of the solution is that it is meant to continue to evolve and grow, bringing additional value to its users with each new release. Today, we are announcing many of the details regarding the next few releases and the additional features and capabilities they will bring. It is exciting to see how a solution that started as an accelerator for customers to launch Infrastructure as a Service and Hybrid Cloud capabilities has grown to include more self-service, automation, scaling, and an extended ecosystem. While there have been great strides made in regards to the technology that makes up the solution and our integration with even more market leading third party software and hardware, it is the integration of lessons learned regarding Day 2 management, additional and more complex -aaS templates, and more engineered workflows that allow the solution to deliver simplicity AND agility. The power of the hybrid cloud lies in the ability to broker services from multiple providers on and off-premises, allowing the diverse workloads in your enterprise portfolio to be serviced in the way that makes the most business sense. The new release of the Federation Enterprise Hybrid Cloud can broker services from even more public and virtual private cloud providers. Now you can choose your cloud deployment based on the right cost, reliability profile, performance, and security across a broad range of VMware vCloud Air Service Providers, and EMC Cloud Services Providers. And if your workload is best suited to OpenStack you can choose that too, as it will be possible to install VMware integrated OpenStack on the same infrastructure as Federation Enterprise Hybrid Cloud. So, if that route is best for you, you could make one investment in infrastructure and run both VMware and OpenStack environments using the same tools. Our Solutions team has taken the advances in technology since the previous version release and built even more capability and value through the integration of lessons learned and additional workflows and automation. 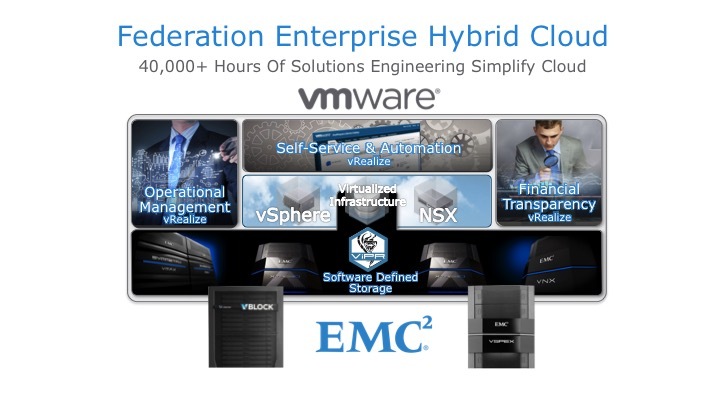 The Federation Enterprise Hybrid Cloud is engineered to increase simplicity through automation and orchestration. Delivering services, applications, and management transparency is key to changing the relationship between IT and the Business and to enabling IT as a Service. The rise of Agile and DevOps and the increased expectations of end users for self-service require IT to automate in order to compete and survive. The Federation has built workflows and service templates to address the common requests from the solution’s early adopters, all aimed at making the management of the hybrid cloud environment easier. You can build and publish complex services that allow for the provisioning and management of your applications, incorporating virtual machines, software and tools, backup, disaster recovery, continuous availability, intelligent monitoring, and scale up and scale down. 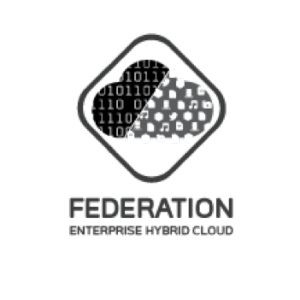 The Federation Enterprise Hybrid Cloud utilizes automation and orchestration to enable you to provision, manage, monitor, and report on IT services that deliver real business value to your users. The Federation Enterprise Hybrid Cloud is built to help our customers accelerate time to value, helping IT enable business outcomes while also addressing cost. The new VCE VxRack hyper-converged infrastructure option allows the solution to offer infrastructure consumption in smaller chunks, and scale storage and compute independently by node. This leads to better economics and simpler scale-out for workloads, enabling more of the enterprise application portfolio to be addressed. The solution also increases visibility into your IT environment by delivering financial transparency with VMware vRealize Business. You can charge the business only for what they use and provide visibility into the true costs of your IT services. There are many more capabilities and features of the upcoming releases of the Federation Enterprise Hybrid Cloud than can fit into one blog post, but I wanted to give you an overview of a few ways that the solution delivers more brokering, automation, and business value. You can find out more about the Federation Enterprise Hybrid Cloud new features and solution improvements here. The post VMworld 2015 Preview and Expectations appeared first on InFocus Blog | Dell EMC Services. As VMworld 2015 is kicking off in San Francisco this week, I’m looking forward to being at the show to hear some exciting announcements and to share in my own session how customers are using our Federation Enterprise Hybrid Cloud solution in their own environments. Last year at VMworld, VMware announced a variety of exciting things, specifically around their support for containers and open-source software, and at a high level what their improvements and advancements were in that space. This year, I am expecting to hear how they have continued to elaborate on these areas in the year that has passed. There also were some announcements about improvements to their suites, as they re-branded their previously named vCloud Suite to the vRealize Suite Cloud Management Platform. Many of our customers are adopting the vRealize Suite. They are on a quest to find that workflow master and “orchestrator of orchestrators,” so to speak, and that is a single software stack that will tie together all the pieces and parts of their data center to simplify and unify management. vRealize enables this vision for many of our customers, so I’m greatly looking forward to what types of things VMware has done with that in the past year as well. In addition to further integration and improvements of things announced last year, I expect to hear a lot more about open-source software and various approaches to that in general at this year’s show. DevOps and automation are big players in this space, so I expect to hear those buzz words flying around a bunch in regards to conversations about open-source. I am really looking forward to hearing more about that and to see what we hear from the product teams on those advancements. I’m also certainly anticipating continued announcements around improvements to the base product, vSphere, and how that continues to improve in terms of features, functionality, performance, and availability. I expect to hear about how the solution has expanded to integrate even more options around disaster recovery and continuous availability. In regards to our own Federation Enterprise Hybrid Cloud solution, we’ve made significant improvements over the last year and are continuing to expand our solutions around it. I’ll have more about the announcements that will occur around our solution, and potentially some additional solutions later in the week. My own breakout session, titled “Learning from the Leading Edge: Real Ways IT Is Creating Value with Federation Enterprise Hybrid Cloud,” is Monday at 5:00pm PST. During the session, I will be talking about how our customers are adopting software-defined data centers to provide an agile platform for ITaaS and lower their operational costs. I will be sharing insights from a variety of real-world implementations of our Federation Enterprise Hybrid Cloud solution and the business and technical benefits clients are realizing as they achieve their software-defined data center goals. I will be reviewing several examples of how customers are utilizing the Federation Enterprise Hybrid Cloud’s features and functions to realize business value and address agility and cost reduction in their environments. I will cover use cases like self-service, PaaS, Hadoop as a Service, and touch on some of the operational changes our customers are making to realize the full potential of the solution. I look forward to seeing many of you at the show this week, happy VMworld! The post EMC World 2015 Reflections appeared first on InFocus Blog | Dell EMC Services. EMC World gets bigger each year, and engagement during the convention continues to improve too. This year, we added some very cool things, such as “Federation Day” and a number of very interesting sessions from IT experts in the IT Leadership Track. On Monday, I had a pretty good crowd for my session, “Learnings from the Leading Edge: Real Ways IT is Creating Value with Enterprise Hybrid Cloud.” During the session, I shared some insight on how our customers are extending their Federation Enterprise Hybrid Cloud to release value and drive consumption. I received a lot of really great questions during the session, including some around the practical ways to consume Hybrid Cloud with existing workloads, what new roles are required when transforming to Hybrid Cloud, and how to set up your cloud when multiple business units are consuming it – multi-tenant versus microsegmentation. There seemed to be a lot of interest in how EMC Education is helping prepare customers for the transformation to Hybrid Cloud through various classes and certification programs. On Tuesday, I facilitated a great Birds of a Feather session on adopting DevOps and Continuous Integration and Delivery with subject matter experts from EMC Professional Services and EMC Cloud Services. Steve Gonzales from EMC Cloud Services shared some anecdotes from his experience running a 10,000 node cloud and gave practical tips on getting started with DevOps and CI like: “pick one simple thing and just get started”. Bart Driscoll from EMC Professional Services shared some stories of customer adoption and walked everyone through how automation and collaboration drives CI/CD pipelines and delivers results. I was also lucky enough to have several really productive conversations with partners, customers, and analysts during the week that gave me a number of things to work on. I also attended some great sessions, my favorite being Jez Humble’s presentation on Enterprise DevOps. We of course launched a number of new and updated products and solutions as well. I’m really excited about the VxRack launch, especially with the reveal of OnRack, our hardware abstraction layer, for more information on that you should read Chad’s excellent blog here. The product I am most looking forward to “playing” with and utilizing for customer solutions is our Project Caspian “industrialized software stack and converged infrastructure” solution. You can see a pretty compelling demo below. 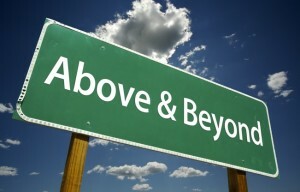 It was an awesome week and I am grateful to have gotten to spend so much time with our customers and partners. Here’s to EMC World 2016! The post Demonstrating the Value of Enterprise Hybrid Cloud at EMC World 2015 appeared first on InFocus Blog | Dell EMC Services. It’s been just about a year now since we announced the EHC solution at EMC World 2014, and boy what a difference a year makes. As EMC World 2015 is fast approaching, I’m really looking forward to being there to hear the planned further announcements and enhancements to the EHC solution, and to demonstrate the success we’ve had in delivering it to customers over the course of this past year. I’m excited to share some of the customer stories that we’ve collected, and also to get some feedback from customers and attendees alike on what we can do to grow and enhance the solution as it continues to evolve. I’m also hoping to hear some further announcements about other federation solutions and new product offerings while at the show. One of the things that we’ve been seeing a lot more of at EMC World in recent years are the Birds of a Feather sessions. It seems that every year we have more and more of these sessions, and they really are a great way to get a bunch of our customers together to share their real world experiences. The topics covered in these sessions in the past have ranged from EHC to management, etc. This year, one of our GS lead Birds of a Feather sessions that I’m looking forward to hearing is, “What Every Infrastructure Manager Needs to Know about Application Transformation.” Application transformation is something we have talked a lot about with customers over the past year, and our portfolio of offerings has expanded many capabilities in this area, so it will be interesting to hear how customers are using technologies in this space. That’s what makes these sessions powerful, they grants us the ability to take one of our solutions or products and learn about what our customers are doing with it in their own environments. I’m looking forward to Jez Humble’s Enterprise DevOps keynote session, Continuous Integration and Delivery are capabilities many of our customers and partners are trying to establish within their organizations to drive value and agility. And Doug Cutting should have an excellent session on Big Data, an area that I’m really excited and passionate about. I think C. J. Desai’s keynote on Wednesday is going to blow people away, I’m really excited to hear what our customers and partners think about his announcements! Through sessions and customer highlights, I look forward to demonstrating at EMC World this year how we in GS ‘make it real’ for our customers. We will be able to share stories about how we’ve done this over the past year through EHC customer installs and transformations. The focus will really be on following up on success stories and what we’ve learned through the process of implementation. This year we will be able to show the value of the solution and why our customers should use it as a basis for their transformation. We can demonstrate things such as time to value, and can quantify impact in more ways around agility and cost savings. I think the nature of the conference, even though it gets bigger every year, it feels smaller because of how effective we’ve become at using the sessions, booths and Birds of a Feather sessions to spend more one on one time with our customers, and that’s what I’m most excited about this year. I will be giving a session at the show titled, “Learnings from the Leading Edge: Real Ways IT is Creating Value with Enterprise Hybrid Cloud” on Monday, May 4th at 1:30pm. During the session I will be talking about some of the real world examples we’ve seen of customers obtaining value and transformation utilizing the EHC solution. I’d be happy to meet with you and discuss hybrid cloud, big data, and DevOps after my session or during the rest of the week! The post Creating Service Blueprints for Hybrid Cloud appeared first on InFocus Blog | Dell EMC Services. 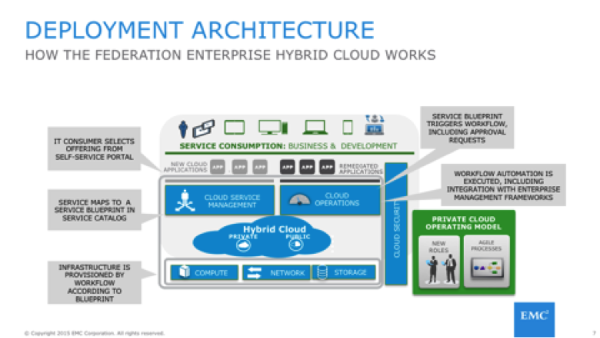 In my last post, I talked about the four ways you can extend the EMC Enterprise Hybrid Cloud (EHC) Solution. 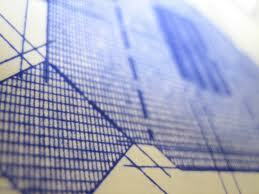 The first is by publishing additional service blueprints to add new capabilities. Many of our customers are adding value to their EHC solution by adopting and publishing new service blueprints such as Platform as a Service (PaaS), Middleware as a Service, or Database as a Service (DBaaS), to transform the way they deliver existing app services. What Exactly is a Service Blueprint? Service blueprints are the automation and orchestration components required to deliver an IT service. They are published in the service catalog and provisioned to a customer via the portal. The initial services provided with EHC are focused on automatically provisioning a virtual machine, with the storage, networking, and operating system required for it to run. EMC EHC makes it easy to build on top of those initial blueprints, to create aggregated or additional services composed of multiple virtual machines, with a variety of software components, to deliver a compelling service to the business. Let’s look at an example. Say you have developed a Java application and you are delivering it as Software as a Service (SaaS) or Platform as a Service (PaaS). This might comprise a front end, some middleware, and a database back end, along with a variety of software utilities and virtual machines to deliver it to a developer as one consumable service. Without this capability, the developer must understand how many virtual machines they need, what software goes on each, and how to configure/integrate those from a network, storage, or backup perspective, and then after ordering the components they must complete the configuration and hope it follows the corporate standards. The value of the EHC solution is increased when you begin to add more complex services for consumption that allow you to build more types of new apps on top of the environment, but you can also migrate legacy apps into the environment and have them land on a standardized blueprint reducing the number of one off technology stacks in the enterprise. For example, if you have a bunch of existing house-built Java apps, with automated and orchestrated service blueprints that deliver a Java environment, you can move these onto the new EHC environment. Now you’ve increased availability, saved costs, and improved operations because now you’re managing one blueprint for say 200 Java apps, as opposed to 20 different implementations of a Java stack in your existing environment. Another example is what we’ve done within EMC IT to provide SharePoint as a Service. EMC IT was getting a lot of requests for the deployment of SharePoint servers as a means to foster collaboration among various business user groups. 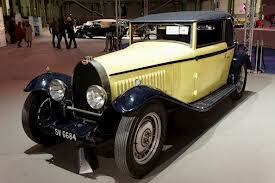 In the past, they had been standing up physical environments with varying amounts of storage, RAM, etc. This was an expensive proposition to manage as it was time consuming, the process was complex, and it took several weeks. Business users just didn’t want to wait that long. So, instead EMC IT defined a new service to make SharePoint available as Software as a Service. That enabled them to reduce costs associated with implementing a new SharePoint environment, reduce the time it took for a customer to get a SharePoint environment, and made the overall operations of that environment that much more simple because they were able to just replicate that blueprint and provision against it as opposed to having to go through design and implementation every time they needed to do it. Business users now get their collaboration sites in less than a day. 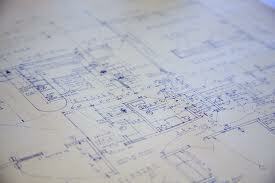 So what are some of the other blueprints that have been created for EHC? We have blueprints for things such as virtualized Oracle, Microsoft SQL server, SharePoint as a Service, parts of the SAP stack, etc We essentially have a library of blueprints that we have built for customers that we can take and customize for a new customer to help them realize value much faster. Our Global Services organization has created a service offering specifically designed to help organizations extend the value of their EHC solution by publishing these additional capabilities and service blueprints. In my next post, I will be talking about how to integrate additional technologies to derive even greater value from the EHC solution.